This is the last blog in a sequence of 3. 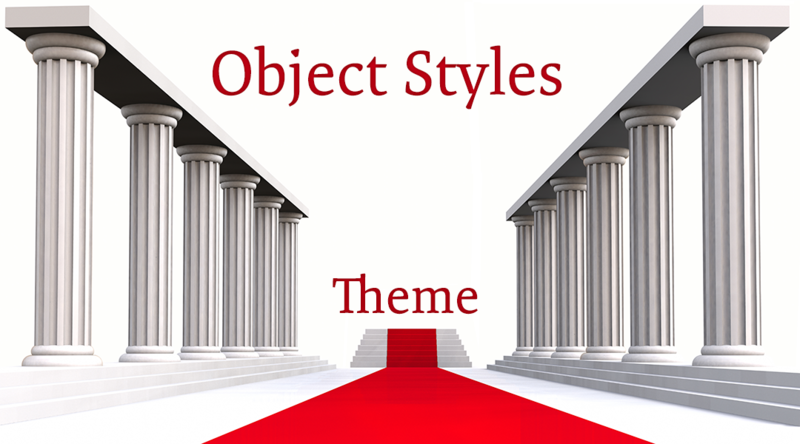 In the first article I explained meaning of Object Styles when creating a custom theme, terminology and how to create a custom object style based on an example on the stage. 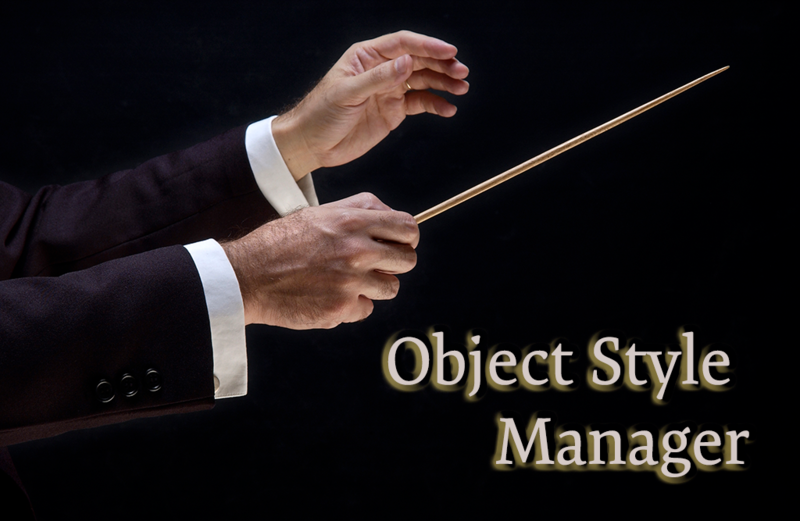 The second post explored in depth the Object Style Manager, for creation and management of Object Styles. In this last article the focus is on Responsive projects: tips and tricks to keep in mind for Object Styles in a responsive theme. Since CP2017 Captivate offers two workflows for responsive projects: first is using Fluid Boxes, second older using Breakpoint Views. Tips will be specific for each of those workflows. If you want to re-read the advantages/limitations of both workflows, may I recommend reading this post. I also mention the workflow of Rescalable HTML project as alternative for responsive projects. For such a project I recommend to use real fluid boxes whenever possible. It is the only way of having a real fluid layout. If you demote (use that negative word on purpose) a Fluid box to a static fluid box to circumvent some limitations like stacking of objects, you lose the real fluidity and the layout can look very weird on smaller browser resolutions. A static fluid box keeps the width/height ratio, and that may cripple other real fluid boxes on the slide, even when you control the exact position. Highlight Box cannot be used because it is meant to be stacked over the object to want to highlight. If outer fill is selected, it is covering up the rest of the slide which is breaking the stack rule..
Rollovers are not possible in any fluid box (not even in a static fluid box): Rollover Area, Rollover Slidelet, Slidelet. The font size which you define in the Object style, will be used for the highest browser resolution. In the default setup, it is indicated as Desktop (default = 1024x627px). If you have set up a higher resolution for the desktop, maybe for a 1280px wide resolution, you could prefer a slightly larger font size. No need to bother about the other browser resolutions. After publishing fonts will decrease in size smoothly until the minimum font size is reached. At that moment the famous ‘icon’ will appear to indicating text doesn’t fit in the available text container (shape or caption). Just one tip: set the minimum font size to 10p if you expect to have learners on small browser resolutions. To have complete control over the layout in different resolutions, you need to switch to Breakpoint mode workflow, using an option in the Project menu. All objects allowed for HTML output can be used in Breakpoint mode. When you check the HTML5 tracker under Project menu, you’ll see warnings about unsupported items like Slide transitions, Text animations. The warning also points to Rollover objects. However they will be functional on desktop/laptop screens when a trackpad or a mouse is used. On Mobile screens, the rollovers will not be functional. I would not recommend to use the Rollover slidelet because it is no longer actively supported and can be buggy. In a Breakpoint views project, the font size will not decrease smoothly when you decrease the resolution of the browser. You have to set up the font size for all the Breakpoints you want to use in your project: from 3 (minimum) to 5 (maximum). Between those breakpoints the font size will remain fixed, equal to the setup for the higher of the two breakpoints the browser resolution is situation: you’ll keep the font size of the Desktop view until the resolution of the landscape Tablet (if you activated it) or the Portrait Tablet is reached. It is no secret that the Adobe team is promoting the Fluid Boxes workflow over the Breakpoints (which mean more work but offer more control to the developer). For that reason, there are no real Breakpoint views themes packaged with Captivate 11 (CP2019) anymore. A responsive project will always start with a Fluid Boxes, where you can use a packaged or custom theme. When switching to Breakpoints that theme loses all fluid boxes, but the object styles for fonts are not changed: all breakpoint views keep the same font size which is the maximum font size set up for Desktop (or higher Custom size) in the Fluid Boxes. I look for the smallest used font size on Desktop, that will have to be 10pt for the Mobile Portrait. Once you have chosen Mobile Portrait in the dropdown list, that resolution will remain for the other styles until you change again. Edit all mobile font sizes at once, related to that smallest size. Landscape Tablet doesn’t have to be much smaller than Desktop, unless you use a really big resolution for the desktop breakpoint. So I’ll set up all the font sizes for that breakpoint. Here is a check list of the objects I usually edit. Know that I never use captions, only shapes as text containers. As for the buttons, only shapes and transparent buttons (compulsory for quiz slides) are used. They appear in the same sequence as in the OSM. Text Entry Box: edit only one style which I set as default style. Smart Shape: for use as text container. Success/Failure/Hint Shape: all need same font sizes. Beware some included themes use same style (Success), you’ll want different styles but with same font size in breakpoints. Quizzing Partial Correct Shape: all other shapes use a default style which has been edited under the Standard objects. IMPORTANT: Do not forget to save the theme when you have finished. Indicate clearly that it is a Breakpoint Views theme. That way you will be able to apply the theme when you have converted another project to a Breakpoint views workflow. If you change the design a lot throughout , it may be worthwhile to create a Blank project with edited font sizes for Breakpoint Views projects. If you do use Breakpoint views because you have learners using a lot of devices and want to have a simple look for the smallest screens instead of having the same layout fluidized, please log feature requests. It should be possible to choose which workflow to prefer when creating a responsive project: Breakpoints or Fluid Boxes. Fluid Boxes should not be imposed by default as is the case at this moment in CP2019. Manage the Object Style Manager! In a first introductory post I explained the importance of Object Styles in any Theme, the terminology and how you can create a custom style based from example object (created on a normal slide). In that article I already posted some screenshots taken from the Object Style manager, but didn’t really provide an in-depth explanation of that window. Do you need to use it? Read this blog if you want to know the answer to that question. You can open the OSM directly from the Welcome screen, without opening any project. The option is available under the Edit menu, or by using the shortcut key SHIFT-F7. Similar to Preferences, which can also be opened from that location (SHIFT-F8) any changes made that way to object styles are global changes, which means they will be applied to all future projects. If you open the OSM within a project, the changes will be applied only to that project. Of course, since Object Styles are part of a theme, if you save the customized theme you can applied it later to any other project as well. 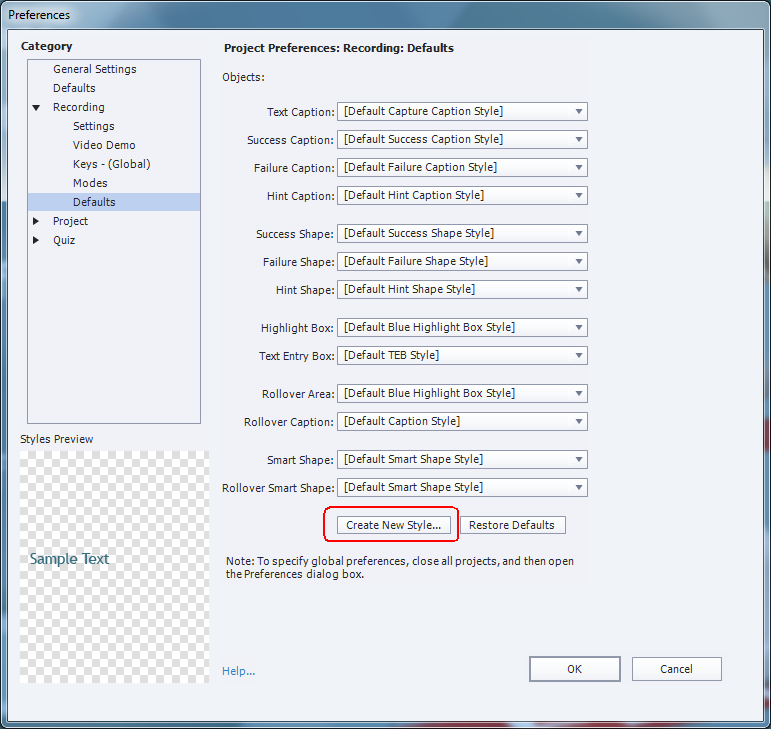 Under Preferences, Recording you can set up the styles used during the creation of software simulations. You also find a button ‘Create new Style’ which will open the OSM. The Object Style Manager has 2 main categories: all Quizzing objects/styles are in the second category “Quizzing Objects”, the other objects/Styles in the first category “Standard Objects”. The triangle button is as usual meant to expand a category or a subcategory. There is one special object ‘runtime dialog box’. 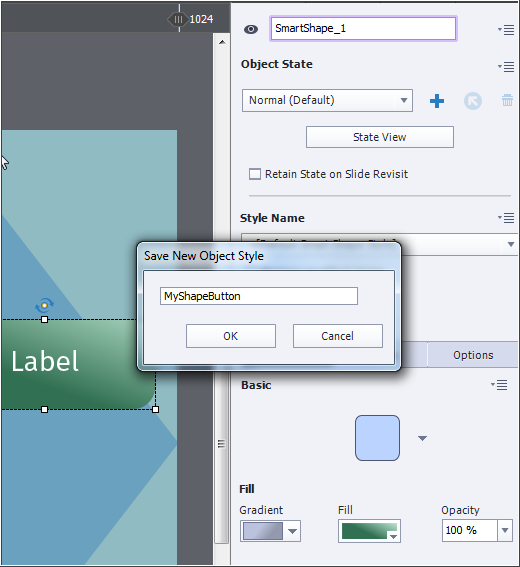 Selecting an object in the top left part will show to the right to available styles for that object, and in the second half of the dialog box all the elements of the style. Down left you see a small ‘preview’ which is not always very WYSIWYG. These are the parts of the OSM dialog box. Objects: I have selected the Quiz button ‘Submit’ in the screenshot. Styles: a button has 4 InBuilt states, but only 3 are included in the style (Visited is missing). I selected the Normal state for the button. This is the default style, but you are free to choose one of the other styles in the list, and you could set it to be the default as well. You can add a custom style (Clone button is highlighted in yellow) by duplicating an existing style and reformatting it. However it is not possible to have a shape button for this quiz button, because there is no original shape button style available in the style list. Components: shows all the components of the style. In this case that is the Button type (here Transparent button, you can change to Text button or Image button), the formatting of the text (font, font size, attribute, faux attribute, color) and Fill/stroke settings for this button. If you switch to a Text or Image button, that will be a lot more limited. The label on the button is not part of the style, you can only change it after insertion on the slide in the Properties panel. Under the Objects window you see a Preview. To be able to see it, the default Label ‘Submit’ is used here. At the bottom you find two buttons Import which allows to import styles that have been exported. The Export button has options which I expanded. The resulting file will have the extension cps. In the first post I explained how to create a custom style based from an example on the stage. Alternative is to create it in the OSM, That workflow is the only way create Global styles (before opening any project). The step-by-step workflow to create a custom Highlight Box will be used as an example. The bright red (color 6) would be excellent as stroke color for the custom Highlight Box. In the Object Style Manager, I find the object ‘Highlight Box’ in the category Standard Objects. This object has 6 default styles. The first labeled ‘…Blue’ is set as default style, but nothing is blue :). In some other themes this highlight box has a light blue stroke. That is not the case in the Windswept theme, because backgrounds are mostly blue: stroke is white; fill is also white but with opacity = 20%. There is no transition. I expanded the style (with the triangle) and it shows two states: Normal and Rollover. For highlight boxes however the Rollover state is not functional (yet). Same styles can be used for Rollover area (and Zoom area), where a defined Rollover state will be visible. For the Highlight box we focus on the Normal state only. Stroke width is increased to 3px, the option 'Fill Outer Area' is checked and set (visible in the Preview) to a 20% dark gray from the tints in the Theme Colors palette. If you want this custom style to be used whenever a highlight box is inserted, check the option ‘Set as Default’. The Style will get marked in bold (Style box). You still have the previous 5 styles available to be used manually. Tip: Same styles are also available for Zoom area and for Rollover Area, as well as the new custom style, which will however not be the default style for those objects. In the screenshot Default styles are indicated by the Bold attribute. 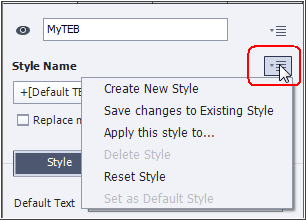 You can change that default style using the checkbox ‘Set as Default’ which was my action for the new custom style. Be sure to put the style you suppose to use most as Default style. I often see themes where a lot of new custom styles are created, either on the stage from example, or by cloning an existing style, but the original styles are left as default styles. Themes are meant to save time, not to increase the amount of work by having to change the styles for individual objects. No panic needed when you forgot to save the theme under a custom name, but have edited a default packaged theme. You can always re-install the original themes from the original Gallery/Layouts folder to the duplicate folder in Public documents (Windows). Promotion to default style can be done globally (as above) or project-based within an open project. No one likes cleaning up! Sometimes the Styles list can become very long, and there is no way to rearrange its sequence (to have the most used styles on top). When a style is selected in the Style box, the Delete button will become active(look at the last screenshot where the RedHighlight is selected as style). Don’t hesitate to delete what you’ll never use. That may be default styles from the original theme as well (you did see how to restore the theme above). It is not possible to delete states (as for the Highlight box, where the Rollover state is unused), nor objects. You always have to keep at least one style for each object, and that will be the default style. If you try to delete a custom default style, you will be asked which style you’ll prefer to use as default style before the style is deleted. When do I use OSM? OSM is the only place where you can see exactly what is included in an object style. That was the reason I mentioned it in my first post, and showed screenshots of different types of Objects. Remember: sometimes the Transition of an object is included, which is not to be found in the Properties panel, but in the Timing Properties panel. One example: I don’t like the default Highlight Box style, which is too ‘bland’. The line is very thin, light blue, with an inner light fill (20% Alpha). I prefer to have a striking color, from the Theme Colors palette, wider stroke and have the outer area dimmed by another semi-transparent color of the Theme Colors palette. I always create that palette before starting with the Object Styles. You have to apply the color palette to the default theme. Before opening a project I will create this global style and set it as default style. If the company has a style sheet,it will often include one or more specific fonts. 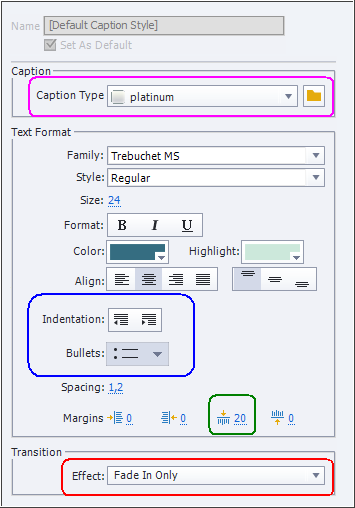 There is no quick way to replace the used font in the theme (often Trebuchet in CP2019's packaged themes) by a company font. In that case I use the OSM and browse through all objects using text. Captions and Shapes do need the change, but if you only use Shapes as text containers, you can of course skip the Captions. Some other objects use text as well: buttons, TEB’s, and quite a lot of Quizzing objects. Some styles with text will appear both under Standard Objects and Quizzing objects. Beware: if you use Learning Interactions, do not forget that they do not ‘obey’ to the OSM! You will have to change the fonts there as well. Some interactions offer the possibility to switch to the Theme Colors, but that is not available for other components of styles. What is different for Responsive projects? 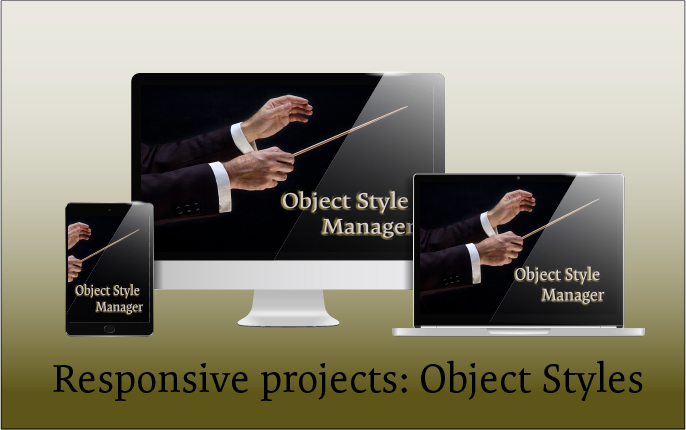 In a last post I will specify what is different in Responsive projects, both for object styles and the Object Style manager. Both workflows: Fluid Boxes and Breakpoint Views will be treated in that third article. The last one reports a serious bug in the Help documentation, the first one is more a lack in that documentation. It is a pity that the Help is not something you can cout on, a problem which is not new at all. I started blogging about 10 years ago because of lacks and bugs in the Help. An “amazing application which is Adobe Captivate” (a quote of a fellow ACP who is not present in this portal) deserves better! I’ll try to answer those two questions here, and offer extra tips for Themes.. Editing or developing a theme start with the colors which will be used consistently in that theme. 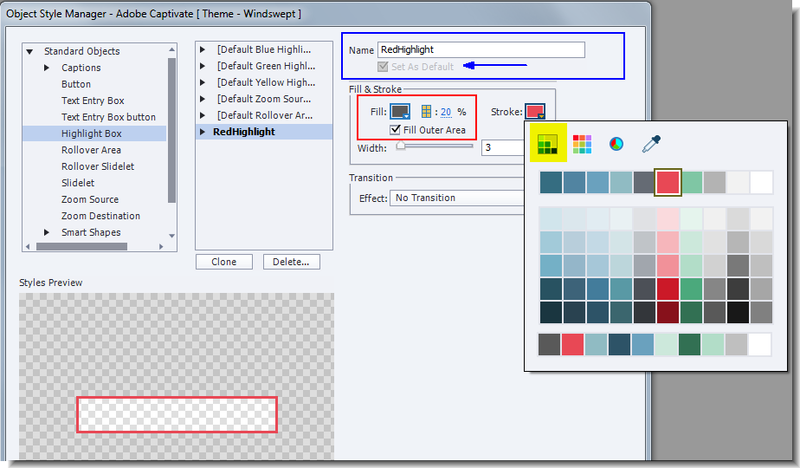 Each theme packaged with Captivate has a Theme Colors palette which is labeled with the same name as the theme. As described in an old post, that palette has 10 colors + 5 extra tints for each color. It is always available in the Color Dialog box as first button, A well designed theme will use only those colors: backgrounds, fill and stroke colors, font color etc. Most Learning interactions have a button to apply the Theme Colors as well. Click the Customize button: the 10 colors will appear in a dialog box. Click the color you want to change, you can use the Swatches palette, or the Color Wheel (where you can type in the hexadecimal code of the color or the RGB numbers). I already mentioned that the theme has to be well designed, only theme colors should have been used (is not always the case). Moreover no object style can be overridden (+ sign in the Style field) because for those the style will not change. Another problem are the backgrounds. 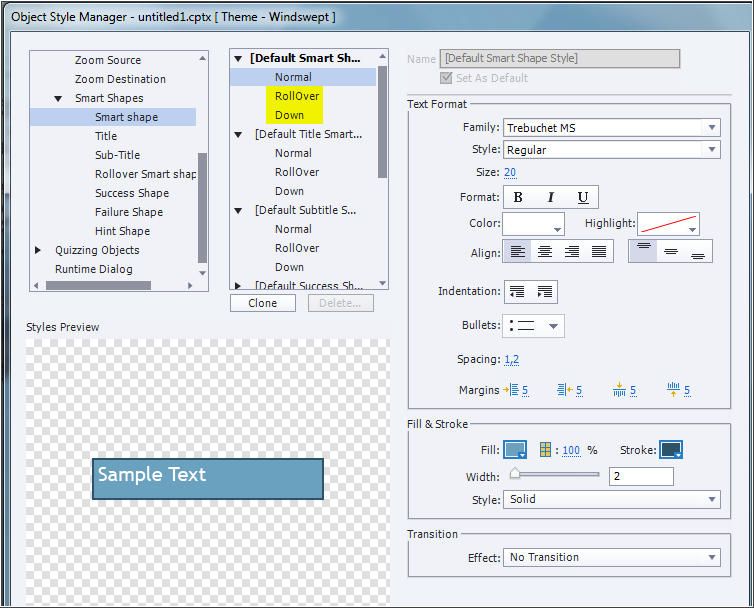 In the screenshot you see one of Captivate’s default themes, using several bluish colors (first three in the palette). Those colors appear also in the backgrounds of several master slides: Title slide, Blank slide, etc You’ll find those backgrounds in the Library as…. images! That means they will not change automatically when ou change one of those bluish colors. That will only happen for the colors when they are used in object styles: fill of a shape, stroke of a shape etc…. As I wrote already multiple times: do not rely on names of the colors, they nave no meaning. In the theme mentioned above, the first color (Title) is never used for any title. This is indeed not fully correct, text obviously was never upgraded since version….6. First, second and last sentences are OK, but not the one with the bold text. The name of the main master slide is indeed the name of the Theme (it is a custom theme based on WindSwept). The main master slide has a solid white color as background. There is NO global project background, the used background is ‘Custom’, and that means that you can have a solid color, a gradient, or a custom image/texture. Those are the same options as for a shape fill. You will see that the label is not appearing in the Properties panel. You can add a label but it will be added to the original name (MyWindSwept), not replace it. You see that the Background is Custom, which means that the color of the Main Master slide is not inherited. In this case the background is fille with an image from the Library. 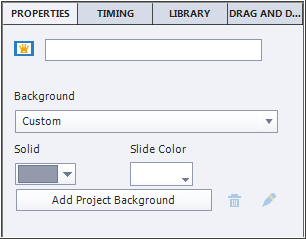 To inherit the color of the Main Master slide background, the Background has to be set to ‘Master Slide Background’. Here is a screenshot of the Pearl theme (default theme if you didn’t change it), which has originally a gray scale Color palette. I changed the background of the Master Slide (which is also set to Custom) to a Solid color, light green. You see here the Properties panel of the Title master slide, which inherited that color. It could also have been a gradient or even an image/texture, would have been inherited as well for master slides set to ‘Master Slide Background’. Project Background is always an image which can be imported from the Library or from another location. Master Slide: where it will inherit the background of the Main Master slide. That can be the Project Background or a Custom Background (solid color, gradient, image/texture). It if is the Project Background, the result of ‘Master Slide’ and ‘Project Background’ is the same for a daughter master slide. Custom: which can be a solid color, a gradient or an image/texture. It is clear that this sentence in the Help text ‘background color of this main master slide appear on all other master slides’ is iwrong. Warning: identical to the one under Theme Colors. If you use images as background, you’ll have to edit them separately when changing the Theme Colors palette, their colors will not change automatically. In the first screenshot you see two system variables on the main master slide: at bottom left the name of the author, bottom right the slide number. Those objects are not part of the background, since they have to be generated on runtime. You could also have shape button (like a Next button) on the main master slide. 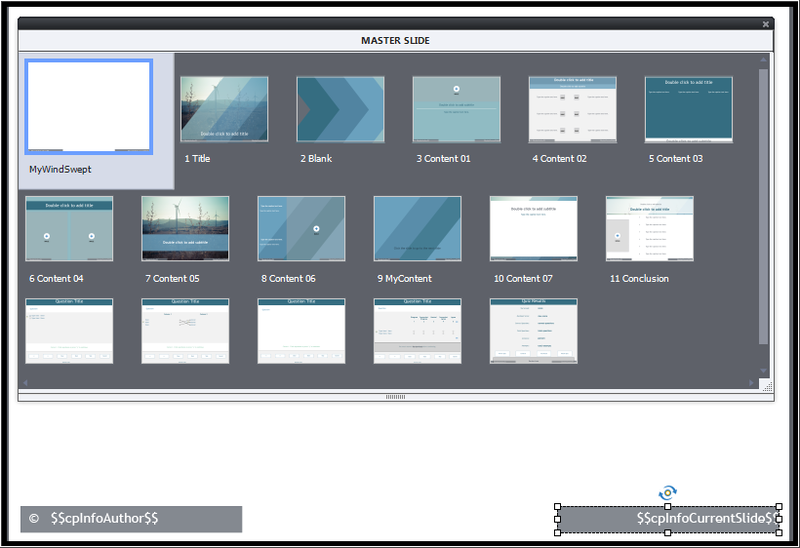 Usually in the packaged Captivate themes both Title master slide and Blank master slide will not show the Main Master slide objects. Quizzing master slides can show them, but in many instances it would be better to turn them off. Be careful with the Blank master slide: it is meant to be used for PPT import, and for Software simulations. It is not recommended to have extra main master slides on them. In the WindSwept theme the Blank master slide has an custom image background, which is very strange, not at all the case in most themes. About the objects on the main master slide, the Help text “Objects …. of this master slide appear on all other master slides” is wrong. A non-responsive theme cannot be used for responsive projects with Fluid Boxes, nor for responsive projects with Breakpoint Views. A responsive theme with fluid boxes (as are most included themes in Captivate, can be used for a non-responsive project, the fluid boxes will be ignored. However be careful: if you edit that theme and save it, you’ll not be able to use it for a responsive project anymore. A responsive theme with Breakpoint views is not included with Captivate. You need to check at least the object styles where text is used, because they need a font size for each breakpoint. You can use it for a non-responsive project, with the same restriction as above when saving the theme. Theme colors palette (see Theme Colors) is the foundation. Palette is independent on type of theme: whether iit is non-responsive, responsive with fluid boxes or with breakpoint views. Object styles, the topic of this blog are the pillars (vertical structural elements). For Breakpoint views you need slightly different styles for objects containing text. Master slides are the beams (horizontal structural elements). As in a building there is a lot of interaction between beams and pillars, together they are the structure You will often going back and forth with object styles while creating the master slides. Master slides depend on type of theme. Now you are ready to complete the building by filling in the walls, floors…. In Captivate we call them slides.and objects. Caption style: includes indeed the font, font size, eventually attributes (bold, italic, light), font color and leading, alignment but also the type of caption, margins within the caption, and the transition type. 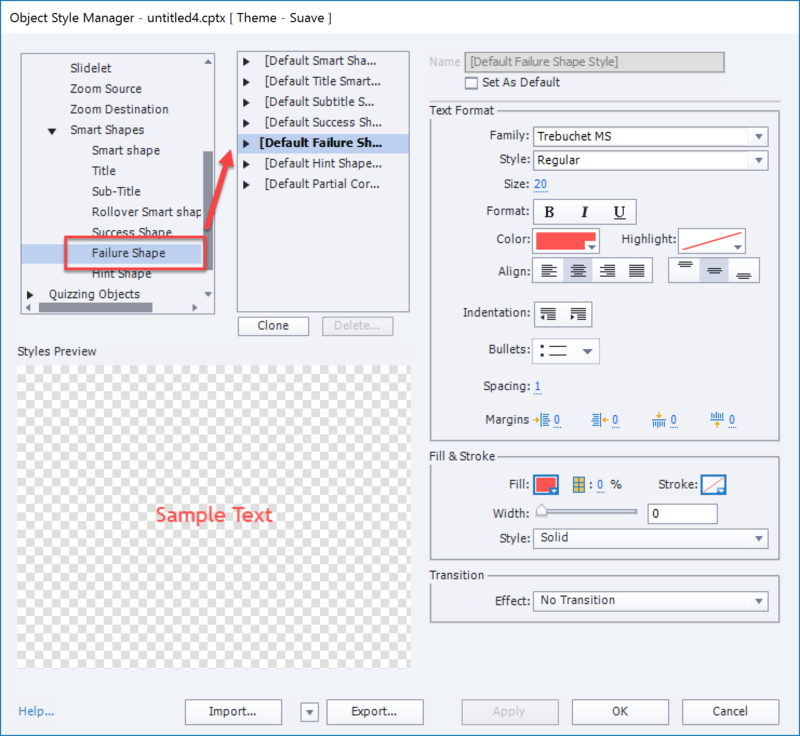 In the themes packaged with Captivate the caption type is mostly set to transparent, but that was not always the case in older versions and doesn’t need to be always transparent. It comes closes to what you know as text styles, but still... transition is unknown in MS Word.. Text Entry Box style: has the formatting of the text but also the Fill (color and transparency) and Transition setting. You cannot edit the stroke, not included. Button style: is more complicated, includes formatting of 3 Inbuilt states (Visited, 4th state is not included). 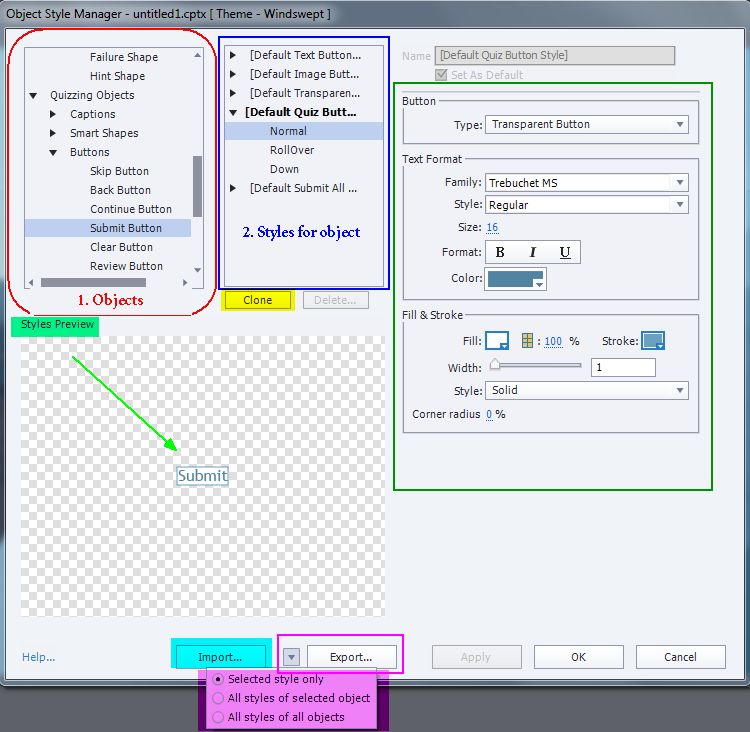 In the screenshot, which shows a so-called 'Default style' (see later) you see that when you insert a button (Interactions, Button) in these settings a Transparent button will be inserted. For each state the text formatting of the label is defined (in case of a Text or a Transparent, button. That setting will not appear for an Image button which cannot have a label. For the transparent button , style includes also the fill (here a gradient, with full opacity), stroke (color, width and style) and the corner radius. Formatting for the two other types is much more limited. 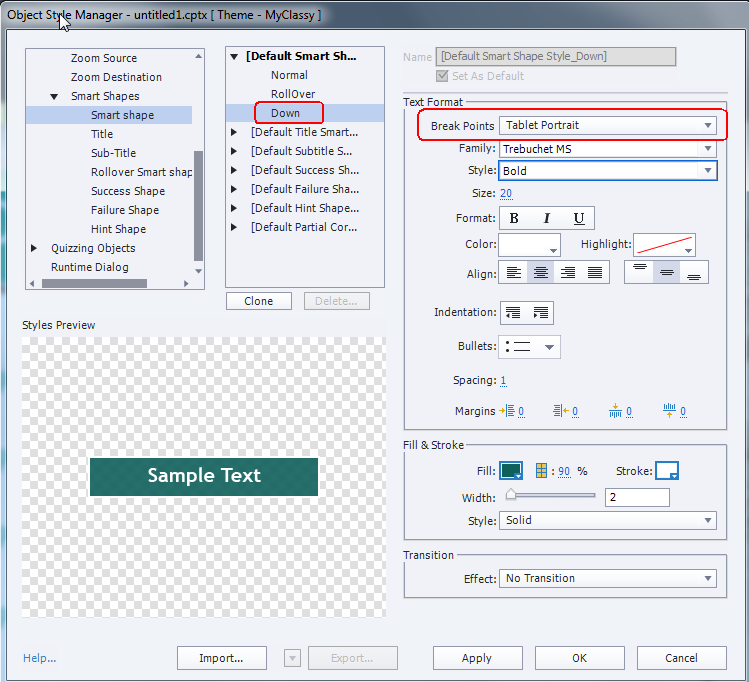 Smart Shape style: the most versatile object in Captivate can be a text container, hence the text formatting similar to captions. SInce it can also be used as a button, you can define the formatting of the same InBuilt states as for the Transparent button. The corner radius is missing You can choose a rounded rectangle as start for a shape button, and it has a yellow handle to edit the corner radius. Overridden Style: If you edit some formatting after inserting an object with its default or manually changed style on the stage, a + sign will precede the style name as you can see in this screenshot (I changed the transparency of the fill and the font size). This is labeled as an ‘overridden style’. Using overridden styles is considered bad practice in any style-based application. Why? It means that if you have to make changes later on, this object will not be touched anymore. Maybe your client/boss wants to have another font for the TEB? If this is the only TEB in the course, you can find it and edit this TEB in place, thus creating an overridden style. When dealing with more TEB’s it is much easier to edit the object style itself (see later). The edited style will be applied automatically to all TEB’s in the course, exception are those with an overridden style. Style menu in Properties panel : many sections in the Properties panel have a so-called ‘hamburger’ (or hotdog) menu button. The Styles part has such a mneu button. In this screenshot you see the style menu expanded for theTEB with the overridden style (previous screenshot). You can choose to create a New style (if I want to keep the default style for later to be inserted TEB’s) or Save the changes to the existing style if you want all the TEB’s in this project to have this edited style. There is also a Reset Style to revert to the original style in this menu. The option Apply this style to…. is a bit confusing for this situation. 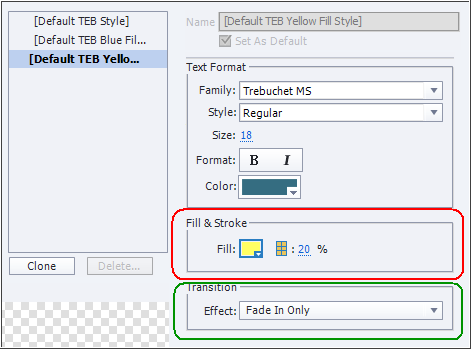 Suppose you have another TEB using the Default TEB Blue Fill Style you can use ‘Apply this Style to all objects with Style Default TEB Blue Fill, but it will be the original Yellow style that will be applied, not the overridden style. I would prefer to save first the edited Yellow style. Have a quick look at the Object Style Manager to see what is included in the style for your object type. I showed several screenshots above. It is not always clear from the Properties panel which features are included in the style. Example: Transition is included in some styles, not visible in the Properties panel but in the Timing Properties panel. Insert an object of that type on the stage. It will be inserted with the style set as Default style. Edit the features which you detected under 1. until you have the wanted look. That is easier to verify on the stage than with the tiny Preview window in the OSM.. Do not forget the states (Normal, Rollover, Down) for interactive objects. The style field (Properties) will show the +sign to indicate the overridden default style. Set the style as Default style: is possible from the same Style Menu. Beware: for the example of the shape button, I would not set this as the default style because all shapes would take on that style. Really hope that we can have a default shape button style which is different from the default smart shape style in a future release. Apply this style for all objects with a specific style. This is a workaround I sometimes use: for shape buttons I don’t use the default smart shape style, but one of the other styles (like a hint shape style if I don’t use it in the project) as long as I am not sure about the wanted button style. When I decide to create the definite style for all shape buttons, I can use the Apply this style to replace all those ‘hint’ shape styles by the new shape button style. This problem only exists for shape buttons. Most other object types are not used for two different goals. If you want to include features which are not part of the style in a quick way, use the duplicate functionality (CTRL-D). It will keep not only the same style in the copy, but all features, including eventually attached advanced actions. Third element of your theme (structure) will be the master slides. Advantage of defining object styles before the master slides is that the inserted objects on the master slides will have the new default styles. That can save time. Just one example: if you use shape buttons on master slides, you will not be able to use 'from example' workflow to create a style for those shape buttons. Reason: the State view cannot be opened when on a master slide, and you need to set up the states. For object styles with a Transition feature, you'll not be able to define them on the master slides neither, because you miss the Timing Properties panel for them. If you have read my article about the 3 most important stumbling blocks for Captivate (newbie) users, you'll know that Themes are amongst them. The components of themes are described in What's in a Theme/template. and in this post you'll learn about he use of Theme colors. Almost daily I see questions, comments on the forums like "I don't use a theme" which is - sorry for the word - nonsense because every project is based on a theme. The theme with the least intrusive design is the Blank theme, which has no color palette and only offers the minimum set of 6 master slides. The feedback captions use an appropriate style in the themes Easiest way to solve the problem would be to change Preferences, Defaults and choose for captions if that is not messing up your design. Below you'll read how to ecit the themes. Where are default Themes stored? C:\Program Files\Adobe\Adobe Captivate 2017 x64\Gallery\Layouts\10_0\en_US. You'll also find the ThemeColors folder in that location. The included themes are: (Blank), Blue, Clear, Clean, OldPaper, Poise, Suave, White (which is the default theme). All themes are responsive, but can be used for normal, blank projects. the Public folder is accessible for developers which do not have administration rights. If a theme seems corrupted or is too messed up, you can always restore it by copy/paste from the Gallery (need for administration rights). If you have both CP9 and CP2017 installed, you'll see both Layouts in the copied folder. But the layouts folder for CP2017 has a subfolder 'bpthemes' containing all the CP9 themes on my system (not sure if that is the case when you only have a CP2017 install). TIP: don't put custom themes in the sames folder as the default themes (Public). If you have to restore all themes by deleting the Layouts folder you will not lose the custom themes. I store them mostly with the project(s) they are used for. I suspect you will want to keep the correct object styles for the feedback messages for future projects as well. Use the menu Themes, option Save Theme. The result will be that the theme is edited in the copied folder, in the Public documents To change the original theme in the Gallery, you'll need to do it outside of Captivate, using Explorer and needing administration rights. However a user yesterday reported that the option 'Save Theme' was dimmed(?). Reason was that he was working in a blank, normal project. All default themes in CP2017 are responsive. To protect the responsiveness, you have to edit the theme from within a responsive project. The option 'Save theme' will be available in that case. You can always use a responsive theme in a normal project. What's in a Theme - a Template? When trying to help Captivate users, I often bump onto confusion between themes and templates. Same confusion can be found in many training schedules and books. There has been a lot of evolution in Captivate since versions, slowly but steadily. Those are not the big hype features that were emphasized everywhere. You know that I often appreciate more the hidden gems, which help any developer to save time and frustration. This article will explain how I am creating custom Themes, and also why I am using Templates a lot less than in earlier versions of Captivate (before version 6). The goal of a Captivate theme is to keep a consistent design throughout your project. It can be 'applied' to any project, even after creation. Although most themes will be created for a certain resolution, when designed carefully it is not necessary to apply it only to projects with the same resolution. When you apply a well designed theme to a project, the 'look' will change immediately and you'll not have to edit the design a lot afterwards. A theme is saved in a file with extension cptm. You can have themes for a normal (blank) or for a responsive theme. Captivate 8 and 9 both have several themes in the box, most of them being responsive themes. They show up as thumbnails when you click on the Big Button 'Themes'. Those Captivate themes are stored in the Public Documents, under the subfolder 'Layouts' of the 'eLearning Assets', at the same level as the Theme Colors palettes. You can store your custom themes in this folder or wherever you want. The Thumbnails view (under Themes button) has a Browse button which allows you to navigate to any folder. I will mostly save a custom theme in the project folder when working for a client. But you see in the screenshot that I have a custom theme (CP8Theme) in the default folder. That folder is a copy of the original Layouts folder in the Gallery under the Captivate installation folder. If you ever have messed up one of the themes in the Public documents, you can restore it from that original folder. If you delete the whole Layouts folder in the Public documents, while Captivate is closed, on restarting the application a new copy of the original folder will be installed in the Public documents (see also my article: Keep your Customisation). To save a theme you need to use the Themes menu, not the big button 'Themes'. Use the option 'Save Theme as' if you started from an existing Captivate theme. A template in Captivate has to be chosen before you create a project. You have to use the option File, New Project, Project from Template. This means that a template needs to have exact the same resolution as you want for your project. As for a theme, there is a difference between a template for a responsive, and one for a normal (blank) project. A template file has the extension cptl. When you create a project from a template, it will get the normal extension cptx. You can edit a template, and that will the only reason why you would save it again as a cptl. It is also possible to create a template from a normal cptx-file with the option 'File, Save As'. There is no 'reserved' folder for templates, Captivate has no included 'templates'. The term is often wrongly used: most Captivate 'templates' that you can find on the web, are just cptx-projects, not templates in the Captivate language. When a template is saved, the used theme, preferences etc are saved with the template. However you can always apply another theme later on. The start point for design consistency in a project is guaranteed by the consequent use of a Theme, which starts with the creation of a palette with 10 colors that will be used for object styles, master slides, skin, and within learning interactions. 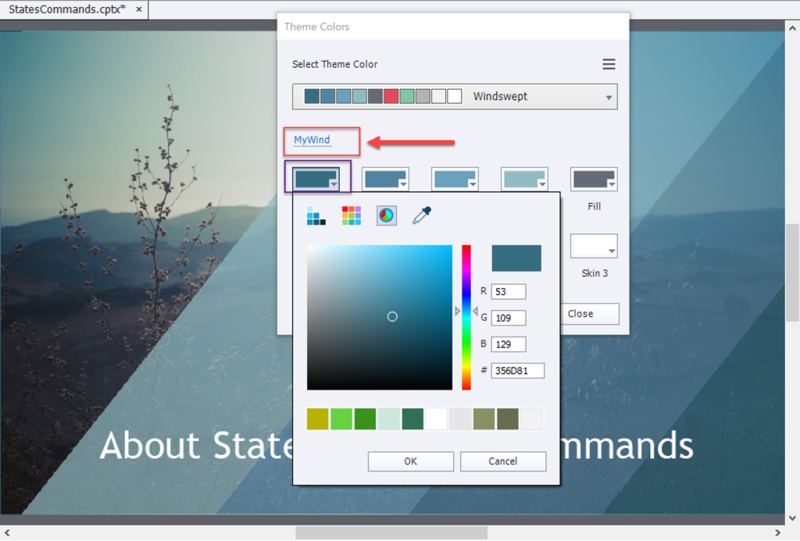 I have written some articles about the creation of a Theme colors palette: Colorful 2015 and Theme Colors. Beware: it is no longer possible to save an ASE file with Adobe Color (as described in the first article): that means that the Swatch Manager is not very useful anymore. My recommendation is to ignore the Swatch Manager and focus on the Theme Colors Palette, which is available in any Color Dialog box. 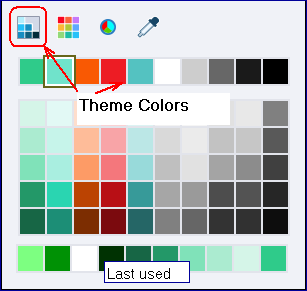 When saving a theme (using the Themes menu), the used theme colors palette will be saved with the same name. In the mentioned articles you'll find a way to save a theme colors palette independently from a theme as well. Most design-oriented applications have a work flow for creation and use of styles (Word, InDesign, Framemaker). All experts and good trainers will tell you to use styles, and to avoid overridden styles. Captivate is no exception in that world: it has a great Object Style Manager to be found under the Edit menu (or by using the the shortcut key SHIFT-F7). Object styles can be saved individually, have the extension cps, only useful in case you want to export/import such an individual style. 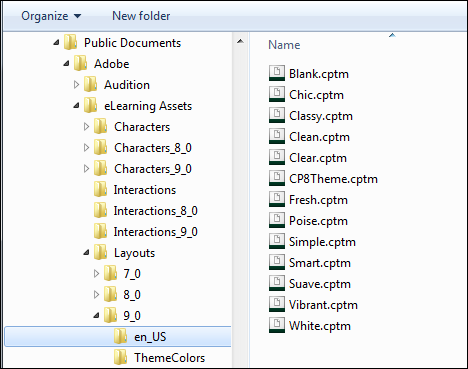 In most use cases you'll save all the object styles necessary for a project in a custom theme, no need to export/import styles anymore as was the case before themes appeared in Captivate. If you are working on a responsive theme: first define the breakpoint views you want in the theme, before launching the Object Style Manager. In the styles you will be able to define the look for the breakpoints that are available in the project. Make some decisions about which objects you'll be using in the theme as well. Just an example: if you prefer using shapes instead of captions for feedback messages, capture messages etc you do not need to change all the caption styles. A similar situation exists for normal buttons vs shape buttons. Use only colors from the palette defined in Step 1. Do not hesitate to change one of the (grayed out) styles between brackets [Default...]. You can overwrite those styles, since you are working on a custom theme. Those are the styles that will be applied immediately when you insert an object. Another approach is to clone a style and set it as Default style. The problem is that you'll end up with tons of custom styles, which makes selecting the proper style in dropdown lists not easier. That is why I always change existing default styles. For buttons: the InBuilt states Rollover and Down are available together with Normal for change in the OSM, do not forget to check/edit those states. This is valid for Text Buttons, Image Buttons and Transparent buttons. For shapes: you cannot define a default style for text and another default style for buttons (too bad), but any shape style that you define should include InBuilt states (Normal, Rollover, Down) because any shape can be converted to a button. Quizzing objects are in a separate category. Quiz buttons cannot be replaced by shape buttons (yet), but you can define an individual object style for each quiz button. Feedback captions can be replaced by shapes. 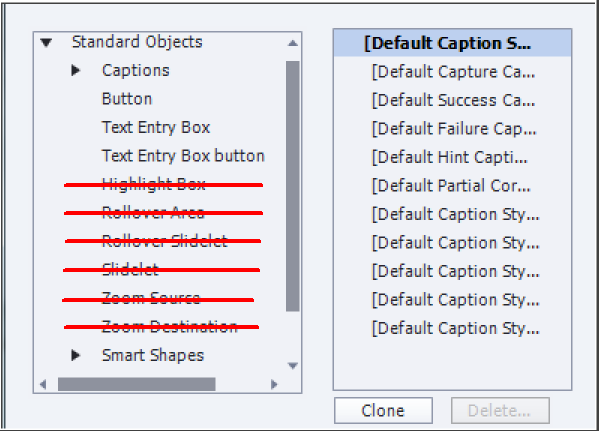 Feedback captions and shapes not always use theme colors in the default Themes included with Captivate. Be careful: if you want to have consistent colors in your project, you'll need to check those styles. It is not possible to define real Effects in an Object style. Only the 'old' Transitions can be defined. The Object styles defined in step 2 - at least the default styles - will immediately be applied to the objects on the Master slides. If it doesn't look well, you can edit the object style and redefine it, while working on the objects in the Master slides (It can be done with the Properties panel). Be sure to make all added objects responsive (check all the breakpoint views) on the master slides. Each theme needs at least 6 master slides (Blank Master slide, 4 Quiz master slides and a Score master slides), besides the main master slide, but you can create as many master slides as you want. You can add different type of placeholders on master slides, but be careful with the 5 master slides for Quiz: the embedded objects (without individual timeline) have a lot of functionality built in! Use the new Rulers to assist you for designing master slides: Guides Rule! If you ever will use the theme for software simulations: keep a real Blank master slide, because it is used both for software simulations and for PPT import. You don't want those slides covered up with other stuff. Use the theme colors palette to customize the skin: playbar, borders and Table of Contents. You can even insert a logo on the TOC and eventually custom expand/collapse icons. Create a default style for the highlight box in step 2: with a big bright red stroke and outer fill. Set it to display as default highlight box style. 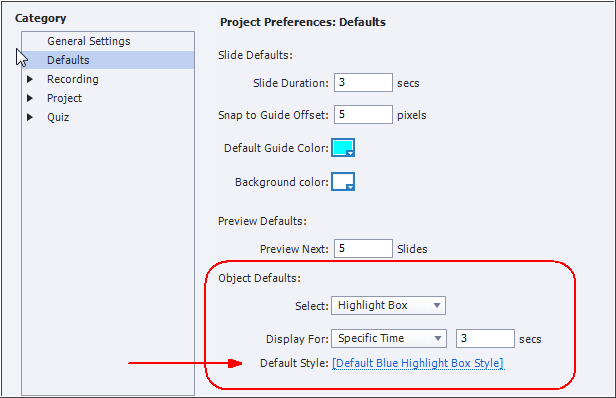 Open Preferences, Recording, Defaults and check the default Highlight box style: it will still be set at the original default style in the original theme. Bit annoying, but it also allows you to save two different sets of object styles within a theme: one for normal slides, and one for software capture slides. Do not forget to save the theme (using the Themes menu)! Do you need a Template? I ask this question often everywhere: with all the design power and flexibility of a custom theme, why would you still need a template? Before themes existed, I used templates to be able to reuse variables and advanced actions (see: Template for reusing script). With the present version of Captivate, we have shared actions which I store in a separate project to be used as external library in any project. Variables, used in those shared actions, get copied automatically when the shared action is dragged into the Library of the new project. When you copy an object, that triggers an advanced action, the action will be copied along when pasted into another project. I used templates to have footnotes on each slide, pointing to the name of the project, showing the slide number and the total amont of slides. But now you can put them on master slides, using system variables or user variables that can be populated later on. When would I use a template in Captivate 9? For courses that have several modules, where you want to have some slides in common, maybe have custom navigation/control buttons that cannot be put on the master slide, but need to be timed for the rest of the project. I would rarely use it to have placeholder slides, unless some team members need to have that assistance. Lot of placeholders have fixed object size, which can just be annoying. If you do have a lot of advanced actions (maybe variables), that cannot be replaced by shared actions, identical entries in Project Info, variables not included in shared actions: those would be situations where I would think about creating a template. I hope this post did clarify the difference between a theme and a template. If you ever see somewhere my question 'Do you need a template', this will no longer be a mystery, right?